OK I am a bit of a nutcase. And most of my friends understand me, at least they say so to my face. I have never figured out why they look so terrified when they say that, but that is fodder for my 'other' blog. Anyway, on a lark I decided that I would meet one of our friends at the airport with a cocktail in hand. A Mai Tai (natch!) in case your wondering, fresh mint and a pineapple spear, the whole works. I had the drink in one glass, the ice in another, and when I got close I did a quick shim-sham with the glasses and ta-da! It was fun. It made everyone laugh. It was a nice ender to what was otherwise not a pleasant trip for our traveling friend. Then I did it again for two other friends flying into town. Then again for the original friend on a return trip. It is a lot of fun, good for a giggle, and if you could have seen the looks the Security gives me you would truly appreciate my still being here to post this and not sending letters to you via carrier pigeon from Gitmo. I think what makes this idea even more fun is everyone else at the airport. I pull into short term parking, get out of the car with a cocktail in hand. And not just a glass of something, a cocktail. Garnish, ice, liquor, the whole nine. People walking whatever direction stop and stare, make comments about what a great idea, and generally get a big smile on. Security looks really confused, like they want to call it in but aren't quite sure what to say to dispatch, so then they just decide to scowl. But they can't because they too want someone to greet them at the airport with a cocktail in hand because it is so apparent that I am bringing this cocktail to someone at the airport and not just walking around looking like Thursten Howell the Third. I have to get more of my pictures fixed and posted up on the internets. 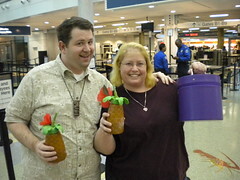 The picture above is from my friend Experiment 33 when they took up my bit of silliness and met some guests at the airport with cocktails in hand. This is not a slight against them, well maybe a little, but they wimped out and went with sippy-style cups that were just slightly less obviously cocktails. In their defense, the couple in the shot was next headed to the Rental Car Counter and having a fully garnished Zombie in hand when checking out a car may not be a good thing.